Not fearing fear itself is better said by “allowing fear to be”. And fear is just another form of energy squeezing, shifting and tightening. Like what I am feeling right now. I would not describe this as fear exactly but more of a broiling kettle of near grief. Not end-of-life grief but an ending nevertheless. Our magnificent holiday ended with a sort of mini family gathering vacation at home. 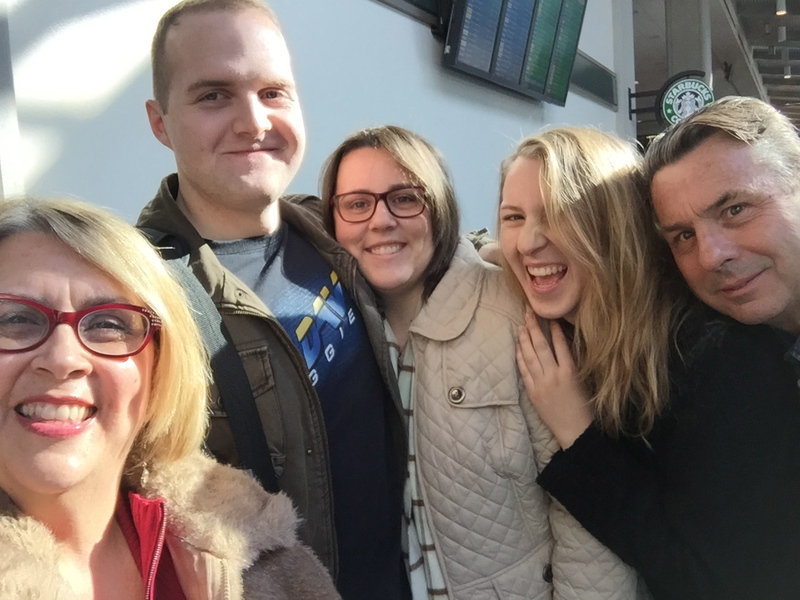 My youngest daughter had to return to the US to get a different visa for a longer stay in England and the fiance of my older daughter was able to get duty here for two weeks so joined us for a belated Christmas-tide. In the next 48 hours both will return to Bath and Pensacola. How can I be both delighted and bereft at the same time? If I was a painter I would paint clashing swirling colors to represent this feeling. I would show a building upswing of grandeur then a desolate cliff or chunk of ocean to indicate the powers at play that must come to separate us humans. I don’t usually like this feeling at all. I get antsy and try to plan unnecessary dinner parties (like I did last night; thankfully wiser hearts prevailed) or buy “one last thing” to go in their suitcases. Instead, I am going to feel this wretched glory and let the tears and laughter flow as needed and celebrate the love that feels so strongly in us all. This, right here, is my fifteen minutes of fame. This privilege to feel so strongly for another that their leaving makes me feel like I am going to throw up. I have come to recognize that the terrible part of this feeling passes fairly quickly when I allow it’s presence as opposed to ignoring, denying or squelching. It is, in fact, the much needed stage for lift off that 747’s go through to get off the ground. I am giving great and bounteous thanks for the time spent with these dear loved ones and am givng thanks for the very study that will draw them away for the next time-being. I am proud of their efforts, plans and their sweet and precious hearts. William Shakespeare really knew what he was saying when he penned: “Parting is such sweet sorrow.” The sorrow is sweet because I can feel the powerful, unending love even as I feel the parting. Both are acceptable in His sight. And…………………eventually………………..in…………………………………mine. I extend comfort, tenderness, quiet, space and acceptance to these thoughts.